As a wardrobe stylist, this has been asked of me time and time again – “How do I find the perfect fit of jeans for my body?”. Well, folks, I’m collaborating with JAG + Fitcode to help real women – with real bodies – find their perfect fit. Fitcode is a fashion data company that is enhancing the shopping experience by focusing on fit, not size. Once you have taken the super short quiz, you’ll get your ‘Fitcode’, so you can shop jeans perfect for YOUR body type. 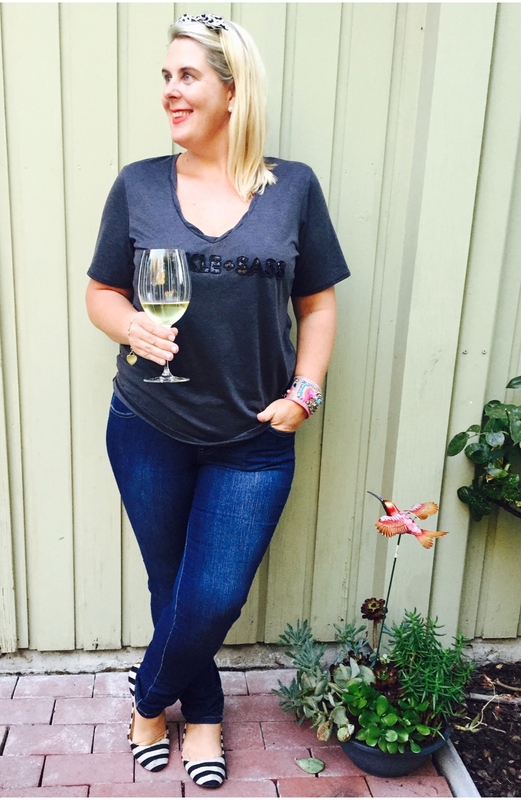 JAG + Fitcode are two Seattle based and women-run brands (side note: LOVE that), that share a common goal of getting women of all shapes and sizes into the best pair of jeans for their body type. Find your fit: Take a short quiz (no measurements needed!) to find your Fitcode and unlock a curated shopping experience. Shop your fit: Browse, filter, favorite, and shop personalized denim recommendations. Dig into denim details and watch fit videos of real women in your Fitcode. Love your fit: Find great-fitting JAG jeans that you love. Once’ your ready to buy, click to purchase. Head to Fitcode to find your special code. 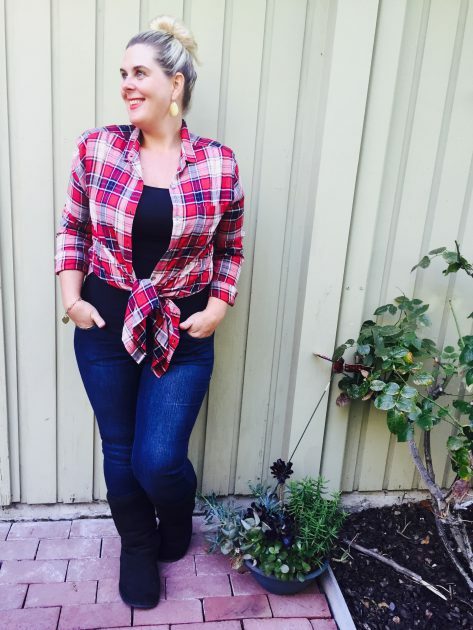 I promise you, you’ll find it fun and empowering to shop jeans, for once! I tried out Fitcode for myself and after coming up with a myriad of labels including Hudson, Paige, JAG Jeans, 7 For All Mankind, Levi’s, Citizens of Humanity, J Brand, JOE’s Jeans, FRAME denim, and Kut from the Kloth; I was kindly gifted two pairs of JAG jeans since I am so trusting of their high quality denim, comtemportary styling, as well as loving how they contour to my waist while flattering my hips and thighs. Enter Promo Code JAGFITS for 20% off your purchase thru 11/4. First up: The Nora Skinny in Anchor Blue. The slim leg fits so effortlessly into my warm Uggs for winter. These jeans help keep it simple as pie with a statement shoes and pointy toe pumps. Look at that pull on waistband. No buttons and zips to deal with. And the Malia Slim in Black. More of that fabulous pull on waist for pure comfort. I hear JAG’s denim experts wear test every style and fabric, and they only give you what they love. The best part is I have found that JAG’s fabrics have just the right amount of stretch while retaining their shape. Styled for winter. 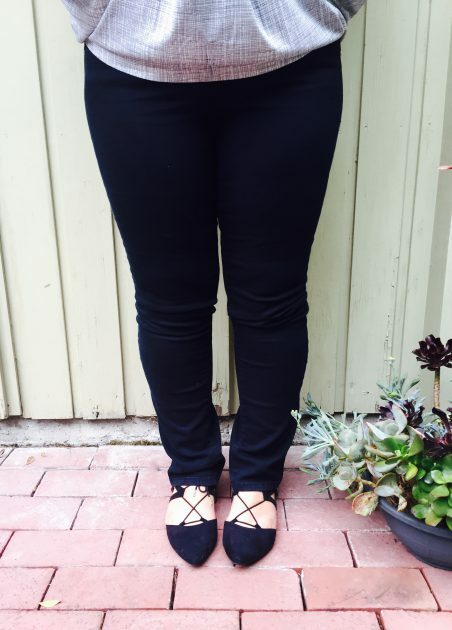 Black skinny jeans should be a staple in your winter closet. Take it from a wardrobe expert. So how was my experience using Fitcode to find the perfect pair, or two, of jeans? In all honesty, I get a tad anxious when it comes to buying skinny or slim leg jeans. You’ll see I have glorious curves, so finding the perfect fit is paramount, so I felt much more trusting when using Fitcode.